Volatility continued in the metals markets last week. We saw large price moves, but prices ended up essentially unchanged. Gold gained $3/oz for the week, closing at $1,663. Silver lost $0.30/oz and closed at $32.28. Platinum underperformed and is once again selling at a slight discount to gold. It closed down $45/oz on the week at $1,631. Investors who had been considering purchasing platinum based on its unusual discount to gold are getting another opportunity (read more about a new platinum product below). All metals are rallying strongly this morning. Volatility and price weakness are testing many investors' confidence. It is easier to buy when prices steadily rise, like they did in 2010 and in early and mid 2011. The correction and consolidation periods are the most difficult, and it is the nature of a bull market to shake investors' confidence during these periods. Savvy investors recognize that the fundamental case for owning precious metals is stronger than ever and view big price corrections as opportunities to add to their positions. The good news is that the softness we are seeing in the retail metals markets is leading to some very good values, especially on certain items sold in the secondary market. These are back-date and previously minted items where the minting cost has already been absorbed by the original buyer. Additionally, we expect to work with the Perth Mint and the Royal Canadian Mint to provide some even lower premiums for short periods of time. Both mints are far more entrepreneurial than the U.S. Mint and thus are eager to increase their market share in the U.S. by offering good values through dealers with special relationships like Money Metals Exchange. Keep your eyes open for more information on these bargains. More Orwellian double-speak from Treasury Secretary Geithner and Fed Chairman Ben Bernanke... Geithner spoke to Congress last week and declared that now was not the time for hopelessly indebted nations to reduce debt levels. In fact, he favors increased borrowing. When pressed to put a number on how much borrowing would be needed, he refused to be pinned down – saying simply that the amount would be "uncomfortable." Finally, metals investors should keep an eye on a breaking story regarding a kilogram-sized (32.15 troy ounces) "good delivery" gold bar that was found drilled and filled with tungsten. It was an expertly done alteration to a bar produced by a major "brand name" refiner and was accompanied by official assay paperwork. If there is one such bar stuffed 30+% with virtually worthless tungsten, there are bound to be many others. concerns about large gold bars in general. How this discovery will impact the markets isn't yet known, but the last thing the Comex and other exchanges need is another blow to investor trust and confidence after the MF Global debacle. Physical buyers should certainly be wary of buying large (kilo size and up) gold bars. They should also think seriously about buying smaller bars only in tamper-proof packaging – such as Money Metals Exchange's preferred Perth Mint bars in 1 oz and 10 oz sizes. Gold bullion coins and rounds with reeded edges deter clipping and drilling and should pose no problem whatsoever. 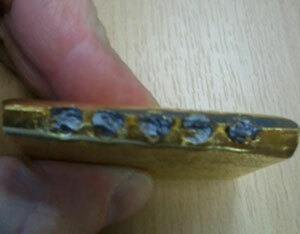 If you already own larger gold bars and want to sell, you should soon expect that buyers will want to assay the bars. That means the bars will be discounted slightly to reflect this cost, and payment to the seller will likely be delayed. Money Metals Exchange had an active week of trading with the usual pattern of silver sales outpacing sales of gold by about two to one. Customer selling was negligible once again, as has been the case in recent weeks. Premiums were flat across the popular bullion forms. 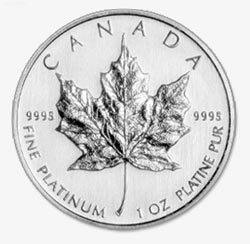 On the new product front, the Royal Canadian Mint (RCM) has resumed production of the Platinum Maple Leaf for the first time since 2008. The Australian Platypus is still available (and for several dollars less than the Maple), but those looking for North American platinum will no longer be forced to pay substantial premiums on the secondary market due to scarcity. Time will tell if the U.S. Mint produces Platinum American Eagles for the first time in nearly 5 years, but the RCM's decision to mint Maple Leafs again might ultimately encourage a return of the Eagle. Sell Precious Metals Coins, Bars, and Rounds. – 1-800-800-1865.